On first thought, it might be hard to find much in common with the depths of the Arctic Ocean and outer space. But think again. Both are extreme environments that hold any number of secrets for scientists to uncover. Robert Sohn, an associate scientist at Woods Hole Oceanographic Institute (WHOI) in Woods Hole Massachusetts, is using the similarities between Earth’s polar regions and space to develop autonomous vehicles capable of exploring environments where people cannot. 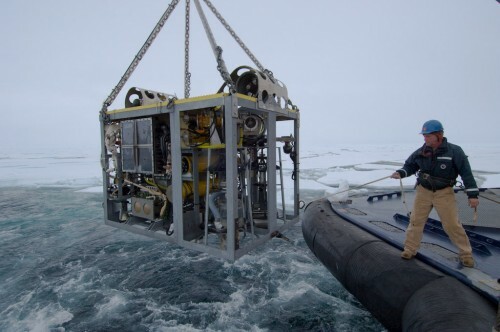 It all started with the 2007 Arctic Gakkel VentsExpedition (AGAVE) to study hydrothermal activity 4 km under the Arctic Ocean (an expedition funded by NSF, WHOI, and NASA). For this project, Sohn,Hanumant Singh, and other WHOI engineers spent four years reconfiguring existing technology to develop autonomous underwater vehicles, or AUVs, to survey the volcanoes of Gakkel Ridge. AUVs are free-swimming underwater robots that can be deployed from a research vessel, which serves as central command. The Arctic AUVs were a success. Together with a specially designed camera and sampling system they returned a suite of evidence that proved volcanoes were erupting violently more than 14,000 feet under the Arctic Ocean – something that scientists thought was impossible due to the extreme pressure. Additionally, the biological samples collected on the volcanic surface yielded a dozen new species of microbes. But the potential use of such vehicles doesn’t stop there. One day they may also be used to explore possible life and volcanic activity in what is thought to be an ice-covered ocean on Jupiter’s moon Europa. For AGAVE, Sohn and the engineering team developed and built two special AUVs, each with capabilities as unique as their names: the PUMA and JAGUAR. PUMA, or Plume Mapper, was designed to sniff out hydrothermal signatures in the water column. It’s equipped with an optical backscatter sensor to gather data on particulate matter in the water column, a CTD, thermal sensors and tools to collect water chemistry data. JAGUAR is a small helicopter-like AUV that works right near the bottom of the seafloor and can hover just above the mountainous volcanic terrain. Scientists attached a special strobe light and camera to snap pictures along the seafloor, creating a photo mosaic. JAGUAR’s full name is a secret for the moment. Sohn explained there are still publications on JAGUAR under development. “All I can tell you is the first two letters stand for ‘Just Another…’ Part of the trick with these projects is coming up with a good acronym. It’s not really an excellent project unless it has a decent acronym,” he laughed. Both PUMA and JAGUAR can conduct underwater missions for 24 hours before being brought back on deck. Another instrument called the CAMPER—or Camera and Sampler—was lowered from the icebreaker on a wire to collect underwater video footage of the volcanoes and plumes. CAMPER also has vacuum cleaner-like hoses to slurp up sea floor and biological samples. While unmanned, extraplanetary exploration may be years away, Sohn and other WHOI engineers will continue to take advantage of Earth’s extreme polar environments to further AUV technology. The next step in the evolution of this technology will be to develop AUVs that can withstand Antarctic conditions and ice cover hundreds of meters thick.